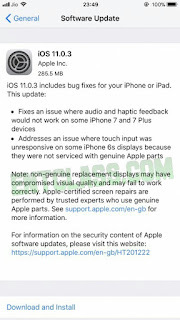 Just last week Apple released iOS 11.0.2 update that focuses on fixing the crackling sound when making calls on the iPhone 8 and the iPhone 8 Plus device and also other minor bugs, the company has yet rolled out another update iOS 11.0.3. The update weighs 285MB in size and as usual came as a bug fix update which focuses on two main issues. The first is an issue with audio and haptic feedback on the iPhone 7 and iPhone 7 Plus, which would not work in some cases. The second is a touch input responsiveness issue on the iPhone 6s units serviced with non-genuine parts. 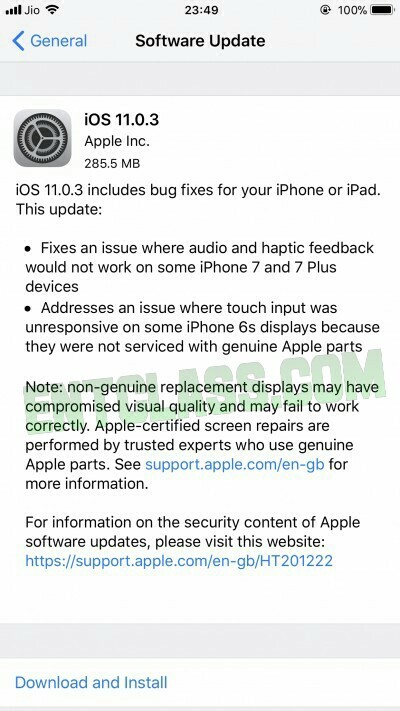 Apple also took this moment to warn against the use of non-genuine replacement displays, which could have compromised visual quality. The update is available for both iPhone and iPad devices via OTA (Over-the-Air) or via iTunes. To perform the update, just go to Settings from your phone > General > Software Update. From there, you should be able to update your iOS device to the latest version. Note that you will need at least 50% battery and about 300MB of data to start the update. nice one from apple they are always trying in their games wish to get more updates from them. Becoming too frequent or don't you think?